LG's smartphone roadmap includes three upcoming WinMo 6.5 handsets. It's being intentionally mysterious about a full touchscreen device, and a touch slider with QWERTY keyboard. 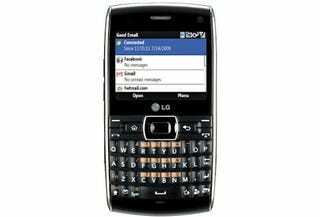 But we do know the GW550 (pictured) will be a QWERTY bar-style model. While the GW550 is mostly aimed at overseas (non-U.S) users, the two mystery phones "will be introduced initially for early adopter customers in Europe, the United States and Asia before being made available globally."